Interests - Having fun! Theme parks and going to the park, transport, spending time with friends and family, Buzz, Fireman Sam, Postman Pat, Thomas etc. Going into hospital (!) and for walks in his pushchair and playing at going to Disney. 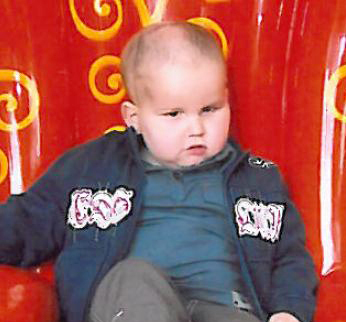 Ben was diagnosed with a very rare and aggressive brain tumour when he was 20 months old. He had a 14 hour surgery which removed most of the large tumour (grapefruit sized) and left a plum sized one which was too close to his brain stem. After 6 months of intense chemo there remained none left! But his 3 month MRI showed it had returned. Again, he had it removed, followed by radiotherapy for 6 weeks to the whole of his brain and spine. Ben remained tumour free for 10 months but then he relapsed again. Once again, he had major brain surgery; they were unable to do a complete total resection although this left him paralysed down his left side, followed by chemo for 6 months. This left no signs of tumour, but once again, 3 months after his routine MRI, it was back (January 2010). We were told we could only prolong Ben’s life but I had contacted a doctor in Texas who specialises in Ben’s tumour. Ben’s oncologist agreed to contact him and he has been having chemo since February 2010. After 2 cycles the MRI shows reduction and his recent one shows no change (could be better or worse). Ben continues to have chemo for 5 days every 3/4 weeks until at least September 2010 when he will have another MRI. Ben’s left side is weak, he has no left peripheral vision, and when outside he holds a hand for safety. He is on steroids for the rest of his life- due to damage from the radiotherapy and has a growth hormone problem. However, Ben continues to be HAPPY and NEVER COMPLAINS. He is an inspiration to us all. We hope and pray there is a cure for him (Ben has been given a 5% chance of the chemo working). Just to let you know that our beautiful Ben passed away on Monday evening, the 4th October. We would like to thank everyone who has so kindly sent him mail. Ben’s MRI is on the 8th September, so please continue to pray and send lots of positive thoughts that it will be improved and the tumour has shrunk. Ben has been really poorly this past week. He has just started to get better. He now eats a piece of toast everyday! He is also slowly getting stronger each day and can sit up a little longer every day. It has been confirmed today, that he has had a bug! We are relieved that it wasn’t the chemo making him as bad as he was. This is Ben’s first month of receiving post and we truly appreciate everyone’s gifts, cards, letters, postcards, pictures and emails. They really help brighten up Ben’s days and we really appreciate it. So THANK YOU ALL for taking the time and effort to send these – words can not express our gratitude. Thanks also to everyone who is involved for all your hard work. Ben had a postcard and card from abroad which was lovely. He loved the picture postcard with the rides on and the train (also the pictures of the animals) as Ben loves these things and had lots to talk about in these cards, so thank you Jane and Bethan. Ben was mesmerised by the picture and rhyme of Banbury Cross – thank you Kath. He also liked hearing from Penny, with the beautiful flower on and hearing about Toy Story 3. A big thank you to Stacey and Louis for the lovely picture you drew, it’s very good!! Ben also really liked the card with Postman Pat and Jess on, he loves it. Ben has had some lovely and very thoughtful letters, we were very deeply touched by the words some of you have written, thank you ever so much, this really helps us “all” especially the letters from; Amalia Nigl and Joe McGee. Also, thank you for the letters from Murphy the Gnome and the rainbow paper from Jill. A very big thank you to everyone who has sent Ben gifts, it’s very generous of you all. He took Postman Pat and the monkey (on different days) into hospital to show them off!! Ben enjoys doing Magic painting and the Toy Story toys are fantastic!! He needed a pencil case and it being Thomas made it extra special. So thank you to: Victoria Grant & Bob (also for the lovely letter), Vicky Sheperd (and for the card), Margaret Schofield (thanks for the lovely words), Penny Berrill, Miss T Davies. Ben started his 8th round of chemo yesterday after a week delay due to his platelets being too low. He will have a MRI scan in 2-3 weeks; this is an extra stressful and worrying time for us. We’re always looking for signs that it has come back, or in our case, if it now has grown!! But we have learnt over the years that there are no early signs!! Ben has started receiving gifts and post this past week and he enjoys opening them all, so thank you all. We will put some photos on here asap! Ben had a seizure on Wednesday and has not been himself since. He is very tired and more irritable. We’re thinking about asking for an early MRI (before his next lot of chemo).